Angka Mahardini from Diponegoro University, sampling a dead coral head from Bali. If you are one of the 7 million people who visit the Smithsonian’s National Museum of Natural History each year in Washington, D.C., then you may have seen a coral reef exhibit in the Sant Ocean Hall. This exhibit shows the dazzling array of different species you can find in a dead coral head, just one small section (about a cubic foot) of these vast reef systems. The data for this exhibit came from Indonesia’s Diponegoro University to tackle the immense diversity of the country’s coral reefs, explain why they are so diverse and help determine how to best manage and sustain these incredible ecosystems. The work is supported by USAID’s Partnership for Enhanced Engagement in Research (PEER) program. 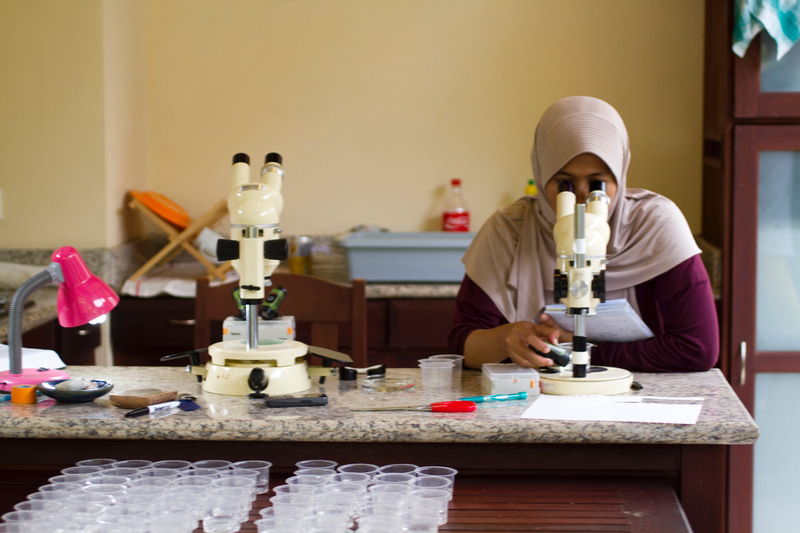 The PEER program funds scientists and engineers in developing countries who partner with U.S. Government-funded researchers to address global development challenges, in this case, using decapods found in coral reefs to assess reef health and help determine management units. Decapods are crustaceans, which consist of different types of crabs, lobsters and shrimp, and play a critical role in maintenance of coral ecosystems. Christopher Meyer, the U.S. partner for the PEER project from the Smithsonian Institution, has been studying marine life for 30 years. The ocean, and especially reefs, still have many fundamental unknown qualities, which drove Meyer to pursue his career exploring marine life. This PEER program gives him an opportunity to pursue questions in this biological hotspot that haven’t been asked before. 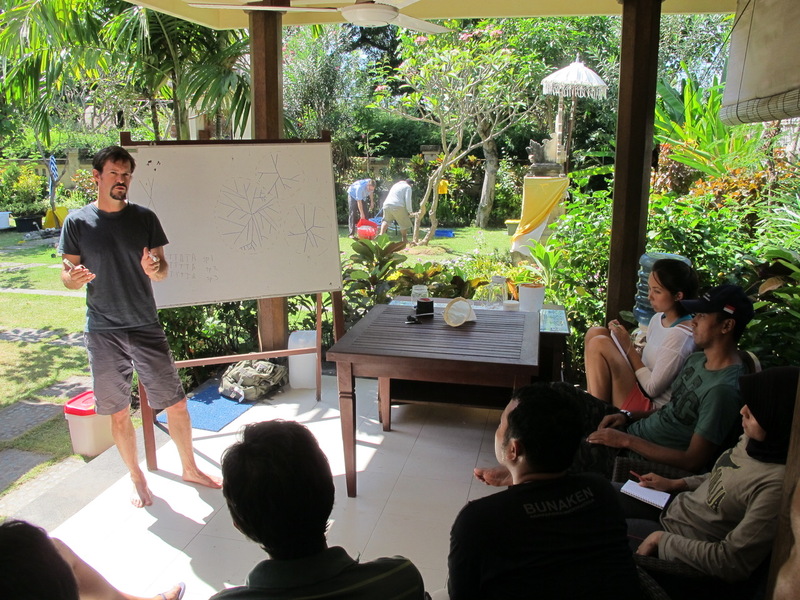 Meyer and his Indonesian research partner, Ambariyanto, who uses one name, are working with multiple universities, government partners and foundations in Indonesia to analyze local coral reefs in order to better understand how to prioritize critical coral reef conservation units in the region. Coral reefs are essential for healthy ocean ecosystems. One third of all saltwater fish depend on coral reefs at some stage in their life. Fish make up an estimated 40 percent of all animal protein in the Indonesian diet, making healthy reefs critical to regional food security. Fish are also an important component of the Indonesian economy exporting close to $4 billion worth of fish in 2012. Meyer says that marine conservation can be harder to promote, because anything covered by water is out of sight. If you can’t see what lies beneath, you are less likely to appreciate the full impact humans are having. Current estimates predict that by 2050, nearly all coral reefs on Earth will be at a highly threatened status. Causes for the endangerment of coral reefs include pollution, overfishing, natural disasters and climate change. Meyer’s attraction to Indonesia stems from the intricacy and pure spectacle offered by its coral reefs. “To have the most impact in sustaining coral reefs, you have to focus on countries like Indonesia, due to both the uniqueness of their ecosystems and the heavy dependence on fish in the local diet,” he explained. During his research with Ambariyanto, they found that one coral head alone can serve as host to almost a hundred decapod species. Twenty-five coral heads from Bali alone contained over 300 species. Coral heads in Indonesia contain more than twice the number of species than those from Australia’s Great Barrier Reef. All this from a ‘dead’ piece of coral, now used as a barometer to measure ocean conditions. Two Indonesian students got a chance to work with Meyer for a few months at the National Museum of Natural History. Both learned new research skills in museum curation and genomic analyses. It is currently cheaper to bring samples for DNA work to the United States than it is to do the work in Indonesia. However, it is becoming more difficult to send DNA from one country to another, so gaining knowledge in DNA approaches will contribute to future research efforts in Indonesia. A lot is still unknown about coral reefs, but you can bet that Meyer is ready and willing to dive in and explore coral reefs for years to come. About the Author: Sara Cardelle is a Communications Analyst in USAID’s U.S. Global Development Lab. Editor's Note: This entry originally appeared on USAID's Impact blog.